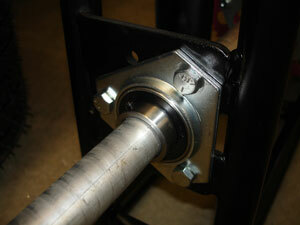 With one bolt, secure the opposite ends of the tie rods to the pitman arms. The pitman arms are the two little arms that are welded to the steering shaft. Bolt the spline steering hub to the steering wheel. 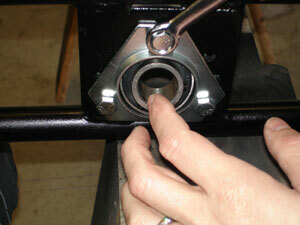 Install the ring clip onto the steering shaft just below the spline area. 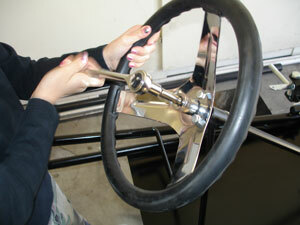 Slide the steering wheel and hub combination onto the steering shaft. 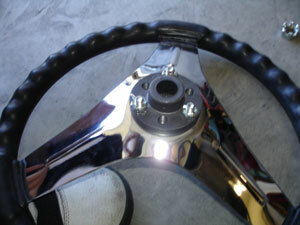 Secure the steering wheel with a slotted hex nut and cotter pin. Install the throttle and brake pedal. The threaded bolt on the bottom of each pedal goes into the loop that is welded on top of the frame rails at the front of the kart. Secure each pedal with a lock nut. Now we will move to the rear of the kart. Start by installing the flangettes and axle bearings. 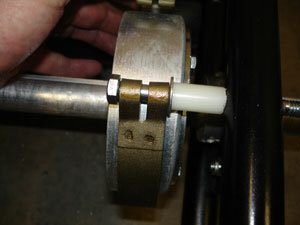 The end of the bearings that has the set screw should be facing toward the outside of the kart. You will sandwich the bearings between two flangettes. Do not tighten the nuts yet. you need to align the axle first. The flangette/bearing on the left side of the kart gets the longer 3" bolts which also secure the brake spacer and the brake. See the exploded view of the Azusa kart for a better understanding of how the brake, spacer, bearing and flangettes mount together. Bolt the sprocket to the sprocket hub. We used an extra aluminum split sprocket we had lying around. 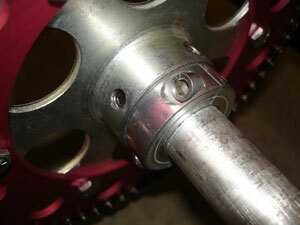 Do not install the sprocket and hub combination onto the axle yet. Slide the axle through the right side bearing first. Once you slide the axle past the motor mount you will be able to slide the sprocket/hub onto the axle. 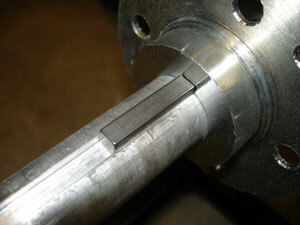 Continue pushing the axle toward the left side bearing/flangette. 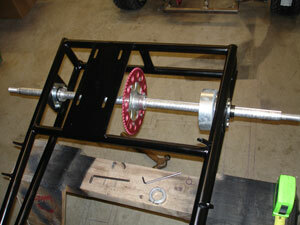 Slide the brake/hub assembly onto the axle and push the axle through the left side bearing. Center the axle so equal portions extend out beyond each bearing. We used a band brake, hub and drum setup for our brake only because we already had one. 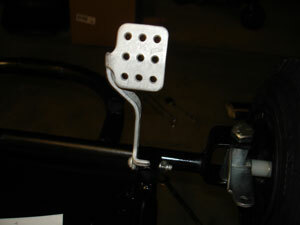 We had to weld an extra tab to the kart frame in order to setup this bank brake with a brake cable. This is a low cost, but effective braking system. We drilled a hole in the left frame rail and secured our band brake with a bolt, bushing and a couple of washers. 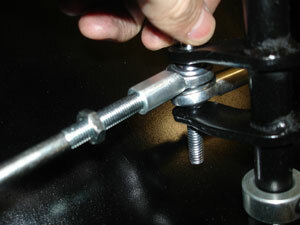 Now you can tighten the set screws in the bearings using loctite on the threads. 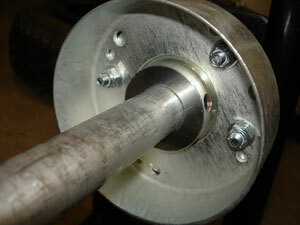 Align the brake assembly and key the brake drum to the axle. We put some loctite on the key so it does not slide out and get lost.